With joy and zest, publicly celebrate milestones and recurring events. Affirming shared history, we nourish community, crystallize a sense of accomplishment, and build group identity by unifying our stories and common goals. Can be planned and ritualized, or as spontaneous as a group cheer. To celebrate is to take a pause in the on-going stream of group life. The pause may involve reflecting back in time and acknowledging what has been collectively accomplished (for example, the yearlong conversations that have led to the adoption of a new governance/decision-making framework), focusing in intently on something occurring in the present (for example, inclusion of new group members), or spotlighting something that is just beginning or anticipated (for example, the ground-breaking for a co-housing community's new garden plot). Celebrating helps us make connections across generations and time, linking past with present, and both past and present with the future. In this way, celebrating helps us see our work and other dimensions of group life in larger cycles and patterns, and connect with people who have come before or will follow us. Celebrations are about stepping back and gaining perspective, which can be rejuvenating for our collective work, especially when we're mired in day to day details and don't see the progress we are making and/or lose track of our overall goals. By breaking the flow of time, celebrations create time for reflection (see action reflection cycle pattern). Celebrations serve many purposes: they affirm/reaffirmation our reason to be together; they build relationship (see tend relationship pattern); they help create culture (see creating a culture pattern); they can help consolidate energies and focus during trying times; they can help make light of what were difficult moments and ease the pain of differences that emerged in a project or process. In the latter two instances, celebrations can become something alchemical, transformative--as the focal point where all the trials and hardships are transformed into positive memories. In this sense celebrations contribute to storytelling and myth building that grows a group's history. Celebrations also serve to connect a group to a larger community by including family members in a workplace holiday event, or board members, donors, partners, and clients in an organizations celebration of a major new initiative. Celebrations may take many forms. They may be as simple as a round of applause for an individual or team that has done a good job with a project, or a round of appreciations from group participants to one another at the end of an intensive retreat. Or they could be more elaborate, involving complex preparations and activities, such as marking the 100th anniversary of an organization, which may take a year or more to plan. Celebrations can honor individual achievements or passages (a group member becoming a parent or earning a college degree or retiring) or collective milestones (the unionization of a group of employees, the incorporation of a new non-profit). 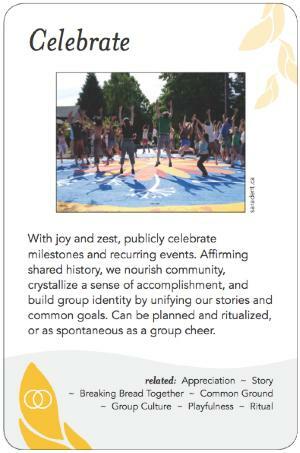 Celebrations might involve some kind of artifact; for example, a banner to broadcast the event, a plaque to commemorate the occasion, a memory book of photos for a co-op community to remember highlights from their first year together. Celebrations are one kind of ritual (link to ritual pattern). We tend to think of celebrations as being joyous occasions, but they could have a more somber or sorrowful bent such as marking the loss of a group member who has died and honoring his/her contributions. Or celebrations could respond to the need for a community to bear witness together of the end of a community or organization. A formal celebration could be therapeutic, helping group members accept the change and deal with grief and loss. Premature celebration can deter the airing of negative feelings. It could be counterproductive to move too quickly if it leaves some of the group silenced or alienated, so make sure there is space to give voice to minority voices even as a group moves forward on something and/or at least acknowledge unresolved issues before commencing the celebrations. People approach major milestones differently and hold divergent opinions about what is appropriate to celebrate and how. Planning for celebrations may bring forth dissonance, as some believe it's premature to celebrate, or the group shouldn't spend so much time or money on a party. Be sensitive to possible concerns and allow space for them to be aired and addressed. Celebration is needed on many scales; for example, a whole event could be a major celebration of a key milestone, or a short celebration lasting only five minutes might appropriately conclude a meeting or other group gathering. Don't forget to honor the smaller accomplishments, and the less visible heroes.